This beautiful vintage modern console features a pull up top with a unique carved pull. Elegant design hides two storage compartments and two mirrors underneath the top. Stylish long spindle legs with stretchers between each adds to the allure. 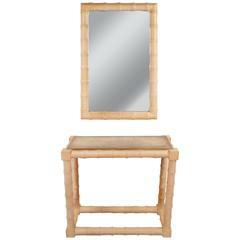 Quality construction has a finished back with gorgeous teak wood grain throughout. Perfect addition to any home, business, or office. Measures: When open the height is 47 inches. Please confirm item location (NY or NJ). age appropriate wear, some minor scratches, mirror has some wear along edges, corner chip, please contact dealer for details. Florence Knoll, Knoll Associates Inc.
Beautiful Danish solid flame teak dressing table with adjustable mirror and six drawers. In great condition. Made in the late 1960s.